Want to support people taking action at DSEI by Legal Observing on site? Green and Black Cross are offering you an opportunity to do just that on the 27th August, just in time for DSEI! If you haven’t already trained as a Legal Observer, this is your chance. If you would like a refresher to prep your mind for DSEI, this will be a good opportunity. 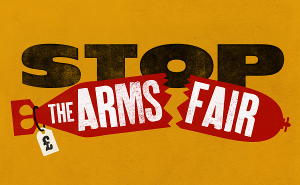 Please email info(at)stopthearmsfair*org*uk to book your place. You’ll often see legal observers at demonstrations wearing bright orange bibs marked “Legal Observer”. Despite having no official status, legal observers have a role recognised by bodies from the Courts to the United Nations. If you’re an experienced activist there will be parts you know already, but the depth we go into should give you more confidence and knowledge of how to deal with the police. Whether you’re in a group or attending as an individual, this extensive training offers you important skills to support activists. There is more information about Legal Observers available here. The venue is Wolves Lane Horticultural and Garden Centre. It is a 12 minute walk from Wood Green Underground station. On GoogleMaps it says it is ‘permanently closed’ but this is to the public: is an old garden centre with a large meeting space. The venue is wheelchair accessible and includes two wheelchair accessible toilets. If you need to drive to the site for accessibility reasons, please let us know when you email to book your place. The training involves periods of sitting down, and also role play activities.